In the Upper Valley Music Center’s series of intimate house-concert-style performances combined with teaching workshops, audiences are treated to vibrant music in close quarters and the chance to learn directly from the artists. Martin Grosswendt and Susanne Salem-Schatz bring blues guitar and vocals to UVMC rooted in decades of singing and playing American roots music. In this workshop we’ll dig into songs from three seminal Delta blues guitarists: Charley Patton, Son House and Robert Johnson. Some previous experience with finger-style guitar as well as knowledge of open G and open D tunings will be helpful. Some of the songs covered are bottleneck pieces, so bring a bottleneck-style slide if you have one. You are encouraged to bring a digital recorder or cell phone with recording capability to capture audio. Have you ever wanted to sing harmony on the fly or work out parts with your band or ensemble? This workshop will get you grounded in chords and intervals that form the basis for vocal harmony and give you the tools to start finding harmony parts on your own. We’ll learn how to find and sing harmonies above and below the melody line, focusing on two and three-part close harmonies which can be used to sing songs from country, bluegrass, old time music, and rock and roll. This workshop is for singers just beyond the beginner stage. You should be able to match a pitch and hold a part against others, such as singing “Row, Row, Row Your Boat” as a round. Students are encouraged to bring an audio recorder to class. Martin Grosswendt is an extraordinary instrumentalist and powerful singer who covers a wide range of American roots music and is particularly well known as an interpreter of the country blues of the 20’s and 30’s. His performances encompass the breadth and depth of American roots music, from classic Delta and East Coast blues, to early country music of the 20’s and 30s from the upland South, to Creole and Cajun music from Southwest Louisiana. His singing and mastery of numerous regional styles on guitar, mandolin, five-string banjo, and fiddle make his concerts events that audiences don’t soon forget. Martin began his musical career in the early 1970’s as a session player at the original Philo Records in Vermont, recording with and accompanying musicians including Utah Phillips, Jim Ringer, Mary McCaslin, and Rosalie Sorrells. At the same time, he pursued his passion for pre-war blues and created a solo career playing the music of legendary bluesmen such as Charley Patton, Blind Blake, Robert Johnson and Blind Willie McTell. His first recording, Dog on a Dance Floor, was released by Philo in 1979. As a solo artist, Martin has shared the stage with legendary performers including Sonny Terry and Brownie Magee, Sam and Dave, Taj Mahal, Paul Geremia, and Henny Youngman. In recent years, Martin has delved even more deeply into Southern roots music. He plays bass (and occasionally fiddle, guitar, and accordion) and sings with the popular Cajun dance band Magnolia, and plays guitar and sings with the Rhode Island Bluegrass super group the Pegheads. A devotee of older country music and Western Swing, he plays Telecaster and sings with the Boston-based band Honky Tonk Masquerade. A gifted and passionate teacher, Martin has private students in bottleneck, flat-picking and finger-style guitar, blues mandolin and old-time banjo. For many years he has been on the core teaching staff at music camps including WUMB’s Summer Acoustic Music Week in New Hampshire, Guitar Intensives in Maine, and Banjo Camp North and Mandolin Camp North in Massachusetts. Over the last decade Martin has recorded two CDs, Call and Response and Payday!, which feature country blues classics, more contemporary, roots-oriented material and original compositions. When Susanne Salem-Schatz raised her three children, rule #4 in the house (after no stealing, lying or cheating) was “you must take music lessons, because there is nothing better than making music with your friends.” With a keen interest in roots country music, Susanne has taken her own advice and brought her strong sense of harmony to a number of Roots and Americana bands in the Boston area, beginning in the 80’s with the country swing/bluegrass outfit, Western Union. She currently shares the vocal duties with singing partner Martin Grosswendt in the roots country and western swing band Honky Tonk Masquerade, where their duet singing has received rave reviews. With vocal training across several genres, Susanne brings a remarkable range to her vocals, moving easily from singing sweet traditional harmonies to belting out jazz standards. 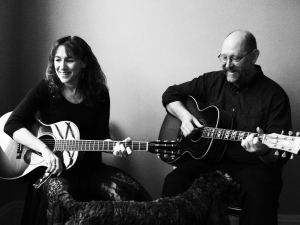 As a duo, Susanne and Martin lend their considerable musical sensibilities to create dynamic and moving arrangements of songs old and new. More than ever, Susanne is convinced that there really is nothing better than making music with your friends.